Melissa Hege, AICP of South Florida-based Melissa Hege City Planning LLC. 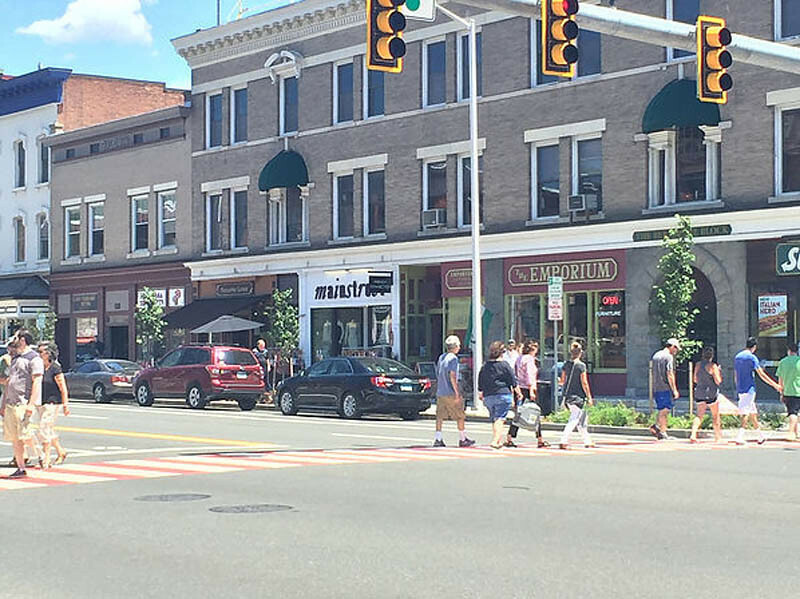 takes a trip to western Massachusetts and highlights affordable, easy-to-implement concepts for enhancing bicycle and pedestrian safety in the public realm. During my summer of travel, we spent two weeks in the Berkshires–a picturesque region of western Massachusetts straight out of a Norman Rockwell painting. No really, this is where Norman Rockwell painted! 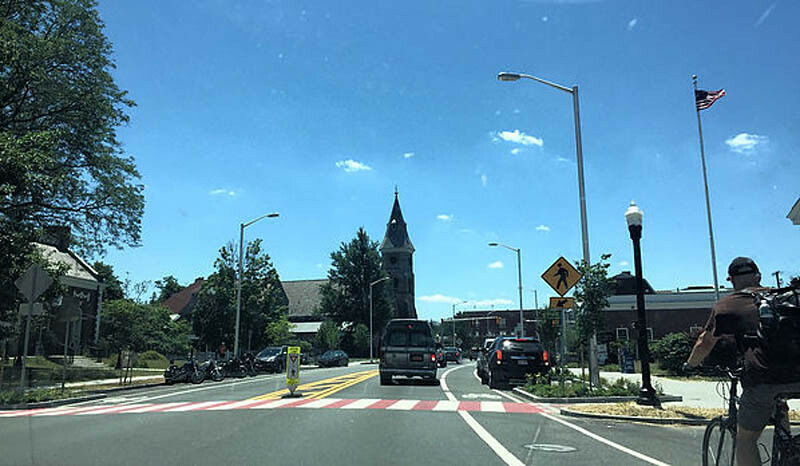 And amid the backdrop of New England churches, glorious mountains and traditional main streets that would make any town planner jealous there’s this…real and effective roadway designs for people on bicycles and on foot. 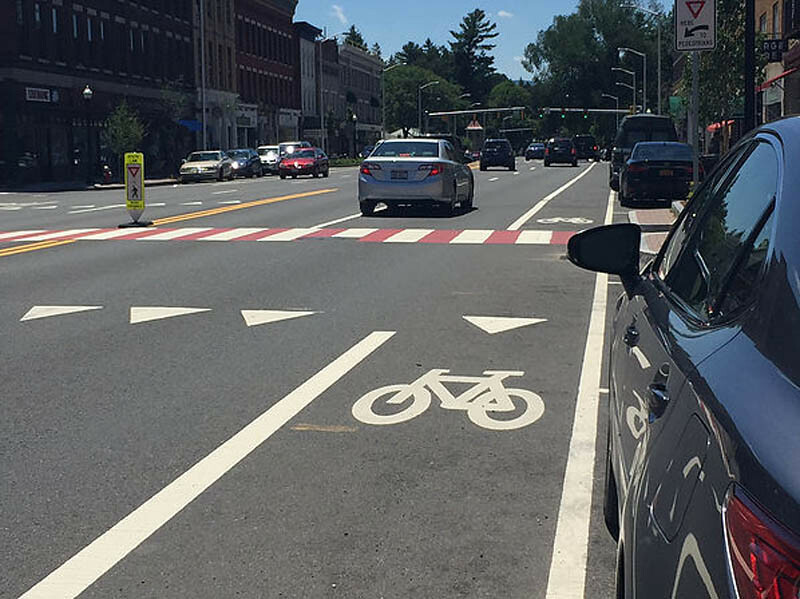 Here in Great Barrington, Massachusetts, big and bold stripped crosswalks alert drivers and cyclists that people may be crossing. The curb extends out to narrow the crossing distance and additional plantings and lighting just make it look nicer. 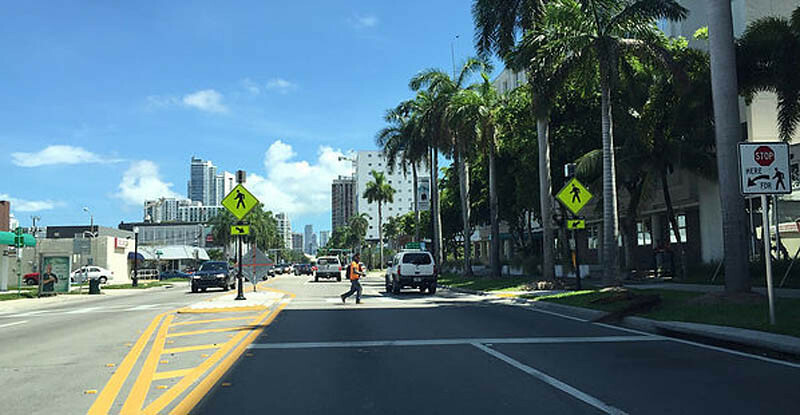 Let’s compare it to the newest crosswalks on Biscayne Boulevard in Miami. A good first try, but is there room for improvement? The brightest thing in this photo is the orange shirt on the person crossing the street. Sometimes the lights on the crossing signs flash, but I often blaze right through these before I notice that the lights have been activated. A brightly stripped crosswalk and changes to the curb might make this crossing easier to see. Here’s a closer look at another crossing closer to town. Notice the thick white lines of the paint to indicate the bike lane and the row of white triangles. Who knew that safety designs could be so simple and cool! Low tech people, doesn’t have to have a huge price tag.